1 Or "Federation of Saint Christopher and Nevis". The Federation of Saint Kitts and Nevis (also known as the Federation of Saint Christopher and Nevis) located in the Leeward Islands, is an island nation in the West Indies. It is the smallest nation in the Americas in both area (104 square miles—269 sq km) and population (less than 43,000). The capital city and headquarters of government for the federated state, Basseterre, is on the larger island of Saint Kitts. The first Europeans to arrive on the islands were the Spanish under Christopher Columbus. He named Saint Kitts Sant Jago (Saint James). However, misinterpretations of maps by subsequent Spanish explorers led Saint Kitts to be named San Cristobal (Saint Christopher), a name originally applied to Saba, an island 20 miles to the north. The smaller island of Nevis, formerly named "Nuestra Señora de las Nieves" (Our Lady of the Snows) lies about two miles southeast of Saint Kitts, across a shallow channel called "The Narrows." It was called "Our Lady of the Snows," because of its large volcanic peak, which due to heavy cloud covering led Columbus to believe (mistakenly) that it was capped with snow. Historically the British dependency of Anguilla was also a part of this union, then known collectively as Saint Christopher-Nevis-Anguilla, but broke away in 1971. Saint Kitts and Nevis are relatively close to a cluster of several other islands. To the north-northwest lie the Netherlands Antilles islands of Saint Eustatius, Saba, Saint Barthélemy, and Saint Martin. To the northeast are Antigua and Barbuda, and to the southeast are the very small uninhabited islands of Redonda and Montserrat. Places of stunning natural beauty, the islands were known in the past variously as "Sweet Island" (Dulcina), "Fertile Island" (Liamuiga), and "Land of Beautiful Waters" (Oualie) by their native inhabitants. The same appreciation of nature remains today and is reflected in the law that disallows any structures to be built higher than the surrounding palm trees, and natural preservation is considered a priority. The country of Saint Kitts and Nevis consists of the two islands contained in its name, Saint Kitts and Nevis. The highest point, at 3,792 feet, is Mount Liamuiga. During the last ice age when the sea level was 200 feet lower, the three islands of Saint Kitts, Nevis and Saint Eustatius (also known as Statia) were connected as one island. Though nearby, the island of Saba is separated from these three by a deeper channel. Saint Eustatius and Saba are part of the Netherlands Antilles. The islands are of volcanic origin, with large central peaks covered in tropical rainforest; the steeper slopes leading to these peaks are mostly uninhabited. The vast majority of the population on both islands lives closer to the sea where the terrain flattens out. There are numerous rivers descending from the mountains of both islands, which provide fresh water to the local population. Saint Kitts also has one very small lake. The capital of the two-island nation, and also its largest port, is the city of Basseterre on Saint Kitts. There is a modern facility for handling large cruise ships here. A ring road goes around the perimeter of the island; the interior of the island is too steep for habitation. is six miles from Saint Eustatius to the north and two miles from Nevis to the south. It has three distinct groups of volcanic peaks: the Northwest or Mount Misery Range; the Middle or Verchilds Range and the Southeast or Olivees Range, The island is 5 miles wide and 23 miles long; it is oval in shape with an area of 68 square miles. A mountainous volcanic ridge down the middle of the island forms a semicircle around a plain in the Southeast. The highest point of the country is Mount Liamuiga, formerly known as Mount Misery, and rises to 3,792 feet, with a lake in its forested crater. All the soil, with an exception of the mountain soil, is light and porous. Most of the beaches are of black sand, which originated from the volcano. is only 36 square miles and lies two miles to the southeast of St. Kitts, separated by a channel known as The Narrows. It is surrounded by dazzling coral reefs. The island is circular, and consists almost entirely of the mountain known as Nevis Peak which is flanked by the lower "Round Hill" on the North and by Saddle Hill on the south. Unlike the light and porous soil of Saint Kitts, the soil of Nevis is clay and studded with volcanic boulders. The climate is similar to that of its partner island. The islands are well-watered and fertile, with a healthy, cool climate. The average temperature is around 80° F and the annual rainfall averages 55 inches. The climate has little variation, but is tempered from December through February by the steady, mild north-easterly breezes called the alizés or trade winds, followed by a slightly hotter and somewhat rainier season from May to November. They lie in the path of tropical hurricanes, which develop between August and October. This period has the heaviest rainfall of the year. In 1999, Nevis was hit by Hurricane Lenny, the most recent hurricane to cause heavy damage to the island's infrastructure. During the seventeenth and eighteenth centuries, massive deforestation occurred as the land was cleared for sugar cultivation. Eventually the sugarcane fields stretched from the coast to the upper regions of the mountain slope in many areas. This intense land exploitation by the sugar and cotton industry, lasting almost 300 years, led to irreparable damage to the island’s original ecosystem. 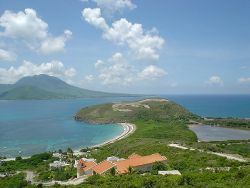 A view of Nevis from the southeastern peninsula of St. Kitts. Saint Kitts and Nevis have one of the longest written histories in the Caribbean, both islands being among Europe's first colonies in the area. Despite being only two miles apart and quite diminutive in size, Saint Kitts and Nevis were widely recognized as being separate entities with separate identities, until they were unified in the late nineteenth century. The first settlers to arrive to the islands were a pre-agricultural, pre-ceramic people, who migrated down the archipelago from Florida. These hunter-gatherers for years were mistakenly thought to be the Ciboney, a native tribe from Cuba. However, archaeological evidence has proven that they were actually a group labeled "Archaic people." In a few hundred years, the Archaic people disappeared. Around 100 B.C.E., the ceramic-using and agriculturalist Saladoid people came to the islands, migrating up the archipelago from the banks of the Orinoco River in Venezuela. These people were then replaced in 800 C.E. by the Igneri people, members of the Arawak group. They were a peace-loving people who migrated up the same path from the Orinoco. They named Nevis Dulcina meaning "Sweet Island," and heavily settled it, climaxing to an estimated population of 5,000. Around 1300 C.E., the Kalinago, or Carib people arrived on the islands. The war-like Kalinago people quickly dispersed the Igneri, and forced them northward to the Greater Antilles. They named Saint Kitts Liamuiga meaning "fertile island," and Nevis Oualie meaning "land of beautiful waters." The islands of Liamuiga and Oualie marked the furthest north the Kalinago had ever reached in terms of permanent residence. It is thought they would have succeeded in occupying the entire archipelago had the Europeans not arrived. Both islands were major bases used by the Kalinago from the south to raid the Taino peoples of the Virgin Islands and Puerto Rico, and were critically important for the Kalinago trade routes to the north. 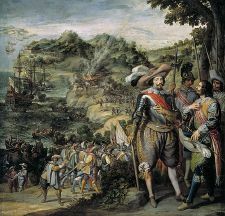 The Spanish capture of Saint Kitts in 1629 by Fadrique de Toledo, 1st Marquis of Villanueva de Valdueza. The first Europeans to arrive at the islands were the Spanish under Christopher Columbus. He named Saint Kitts Sant Jago (for Saint James, one of Jesus' twelve apostles). However, misinterpretations of maps by subsequent Spanish explorers led Saint Kitts to be named San Cristobal (Saint Christopher), a name originally applied to the island of Saba, 20 miles north. 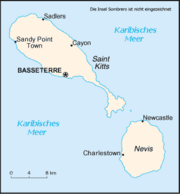 Saint Christopher was eventually transliterated to Saint Kitts. Nevis was named "Nuestra Señora de las Nieves," or "Our Lady of the Snows," because of its large volcanic peak, which due to heavy cloud covering at its peak, led Columbus to mistakenly believe that it was capped with snow. The first non-Spanish settlement attempt in the Caribbean occurred on Saint Kitts, when French Jesuit refugees from the fishing town of Dieppe established a town on a harbor on the island's north coast, which they also named Dieppe, in 1538. However, only months after the founding, the settlement was raided by the Spanish and all the inhabitants were deported. The next European encounter occurred in 1607 when Captain John Smith stopped at Nevis for five days before founding the U.S. colony of Virginia. Captain Smith documented the many hot springs in Nevis, whose waters had remarkable curative abilities against skin ailments and bad health. The island of Nevis was colonized in 1628, by British settlers from Saint Kitts. Saint Kitts became the premier base for British and French expansion, and the islands of Antigua, Montserrat, Anguilla and Tortola for the British, and Martinique, the Guadeloupe archipelago and St. Barths for the French were colonized from there. Although tiny in size, and separated by only two miles of water, the two islands were always viewed and governed as completely different states until the late nineteenth century, when they were forcefully unified along with the island of Anguilla by Great Britain. An unsettling relationship remains, with Nevis accusing Saint Kitts of neglecting its needs. Saint Kitts and Nevis along with Anguilla, became an associated state with full internal autonomy in 1967. Angullians rebelled, and their island was allowed to separate from the others in 1971. Saint Kitts and Nevis achieved independence in 1983. It is the newest sovereign nation of the Americas. 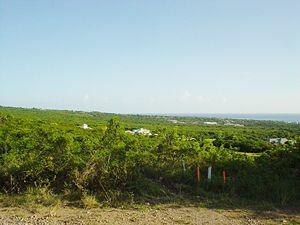 In August 1998, a vote in Nevis on a referendum to separate from Saint Kitts fell short of the two-thirds majority needed. In late September 1998, Hurricane George caused approximately $445 million in damages and limited the gross domestic product (GDP) growth for the year. Alexander Hamilton, the first United States Secretary of the Treasury, was born in Nevis and spent his childhood there and on the island of Saint Croix. Saint Kitts and Nevis is a full member of the OECS. The country is an independent Commonwealth Realm with the royal head of the monarch of Great Britain as its head of state, represented in Saint Kitts and Nevis by a Governor-General, who acts on the advice of the Prime Minister and the Cabinet. The prime minister is the leader of the majority party of the House, and the cabinet conducts affairs of state. Saint Kitts and Nevis has a unicameral legislature, known as the National Assembly. It is comprised of 14 members: Eleven elected Representatives (three from the island of Nevis) and three Senators who are appointed by the Governor-General. Two of the senators are appointed on the advice of the Prime Minister, and one on the advice of the leader of the opposition. Unlike the situations in other countries, senators do not constitute a separate Senate or upper house of parliament, but sit in the National Assembly, alongside representatives. All members serve five-year terms. The Prime Minister and the Cabinet are responsible to the Parliament. 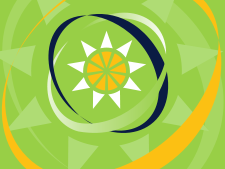 Saint Kitts and Nevis is a full and participating member of the Caribbean Community (CARICOM) and the Organization of Eastern Caribbean States (OECS). The country is divided into 14 parishes. Nine are located on the island of Saint Kitts and five are on Nevis. Saint Kitts and Nevis is a twin-island federation whose economy is characterized by its dominant tourism, agriculture, and light manufacturing industries. Sugar had been the country's main export crop since the 1640s, but increasing production costs, low world market prices and the government's efforts to reduce dependence on it have led to a growing diversification of the agricultural sector. In late 2005, the government decided to close down the state-owned sugar company, which had produced losses and was a significant contributor to the fiscal deficit. Former sugar plantations still dominate the Saint Kitts landscape. Nevis grows primarily cotton, vegetables, and coconuts. The agricultural, tourism, export-oriented manufacturing, and offshore-banking sectors are being developed and are now taking larger roles in the country’s economy. The growth of the tourism sector has become the main foreign exchange earner for Saint Kitts and Nevis. The country has also developed a successful apparel assembly industry including batik-dyed fabrics and other clothing, as well as furniture. They operate one of the largest electronics assembly industries in the Caribbean. During the 1990s, Saint Kitts and Nevis registered an annual Gross Domestic Product (GDP) growth of 5.5 percent, but the strong growth was interrupted by devastating hurricanes in 1998 and 1999. Post-hurricane reconstruction led to an economic resumption in 2000 with GDP growing at 6.2 percent. The year 2001 began well although the post-hurricane construction boom was over and growth was slowing from its 2000 rate. Following the terrorist attacks in the U.S. of September 11, 2001, tourism arrivals dropped off precipitously and activity in related sectors of the economy, such as road construction and retail sales, declined along with tourism. As a result, the GDP growth declined substantially in 2001 and 2002. Economic activity has recovered since 2003, mainly driven by strong growth in tourism. In view of its high level of public debt, the country needs a prudent fiscal policy to ensure sustainable economic growth. Saint Kitts and Nevis is a member of the Eastern Caribbean Currency Union (ECCU). The Eastern Caribbean Central Bank (ECCB) issues a common currency (the East Caribbean dollar) for all members of the ECCU. The ECCB also manages monetary policy, and regulates and supervises commercial banking activities in its member countries. They are also a member of the Eastern Caribbean Telecommunications (ECTEL) authority, which is developing the regulations to liberalize the telecommunications sector in the region. According to a July 2005 census, there were an estimated 42,696 inhabitants; 11,181 on Nevis, and 31,515 on Saint Kitts. The average life expectancy was 72.4 years; 69.56 years for males and 75.42 years for females. The population is predominantly Black (90.4 percent). The Mulatto population is five percent, East Indian is three percent, while White is one percent. The country's official language is English. The people of Saint Kitts and Nevis are devoutly religious, mainly Christian. Several historic Anglican churches remain on Nevis, and 50 percent of the country's population still practices Anglicanism. Other denominations are Methodist and small groups of Moravians and Roman Catholics. There are some Rastafarians and Baha'i followers. An old Jewish cemetery on Nevis proves that there was once a Jewish population as well, but currently there is no active Jewish community in the country. Emigration has historically been very high, and the population is about 25 percent lower than at its peak in 1960 of 51,100. The culture of Saint Kitts and Nevis has grown mainly out of the West African traditions passed down from the former slave population. French and British colonists both settled the islands, and for a period of time the British imported indentured Irish servants. British influence remains in the country's official language, English, while some islanders speak an English-based Creole. The influence of the French, Irish, and Caribs seems less pronounced than that of the West Africans. As in other Caribbean nations, the culture on Saint Kitts and Nevis is festive and vibrant. Carnivals and celebrations play an important role in island life. At Christmas time (December 17 to January 3), Carnival is in full swing. The opening gala takes place in mid-December, with events going on until a few days after New Year's. Among these events, crowd favorites include the Miss Caribbean Talented Teen Pageant, the Junior Calypso Show, and the National Carnival Queen Pageant. Of course, there are also plenty of parades full of people wearing colorful, spangled costumes. Another very popular aspect of Carnival, Masquerade (or Mas) evolved over the past three centuries from a mix of African and European traditions. Masquerade performers wear brightly patterned long-sleeved shirts with trousers, embellished with bangles, mirrors, and ribbons. Topping off their costumes are masks and headdresses decorated with peacock feathers. Their dances combine elements of waltzes, jigs, wild mas, fertility dances, quadrilles, and other traditional African and European dances. Stilt-walkers called Moko-Jumbies wear similar but simpler costumes. Wearing stilts six to eight feet high, Moko-Jumbies dance to entertain the crowds. Clown troupes also perform. In groups of about 50, they dance while a live band plays music. Bells on their baggy, vivid costumes jingle as they move. Pink masks (originally meant to represent Europeans) cover their faces. Apart from Carnival, the island of Nevis has its own unique festival, Culturama. Celebrated on the weekend of Emancipation Day, it began in 1974 when some islanders feared that their native folk art and customs were being lost. They started Culturama to reconnect people with their traditional culture. In addition to arts and crafts, the five-day long celebration includes dances, music, drama, and fashion shows. Parties, boat rides, swimsuit contests, and street jams have also become part of the festivities. La festival de Capisterre celebrating Independence Day in Saint Kitts and Nevis (September 19), in the Capisterre region. All celebrations typically feature parades, street dances and salsa, jazz, soca, calypso and steelpan music. There's also the Annual Saint Kitts Music Festival. Hearkening back to its British occupation, the country's most loved sport is cricket. Local, regional, and international matches are played. Horse racing is also popular, particularly on Nevis. The monthly races are festive events, with music and barbecue adding to the fun spirit. Mountain biking, golf, and soccer are other pastimes. Saint Kitts also hosts an annual triathlon and an annual swim across the channel between the two islands. Kim Collins is the 100 meter world champion and a national hero. He won in 2003, with only 0.02 seconds between him and three others. The Saint Kitts and Nevis national football (soccer) team, also known as the "Sugar Boyz," has experienced some international success in recent years, progressing to the second round of qualification for the 2006 FIFA World Cup in the CONCACAF region, defeating the U.S. Virgin Islands and Barbados before they were outmatched by Mexico, Saint Vincent and the Grenadines, and Trinidad and Tobago. ↑ 1.0 1.1 1.2 1.3 Saint Kitts and Nevis International Monetary Fund. Retrieved October 20, 2016. ↑ CountryWatch, Inc, Saint Kitts and Nevis. Retrieved October 20, 2016. Cameron, Sarah, and Ben Box. Caribbean Islands Handbook with the Bahamas. Bath: Footprint, 1998. ISBN 0844249637. Kozleski, Lisa. The Leeward Islands Anguilla, St. Martin, St. Barts, St. Eustatius, Guadeloupe, St. Kitts and Nevis, Antigua and Barbuda, and Montserrat. Discovering the Caribbean. Philadelphia: Mason Crest Publishers, 2004. ISBN 978-1590843079. Richardson, Bonham C. Caribbean Migrants Environment and Human Survival on St. Kitts and Nevis. Knoxville: University of Tennessee Press, 1983. ISBN 978-0870493614. All links retrieved October 20, 2016. Nevis Financial Services. Nevis Ministry of Finance. Online Local News Station. SKNVibes. Official Tourism Authority Site. Explore St. Kitts. Official Tourism to Nevis Island WebSite. Nevis Tourism Authority. Personal Guide to St Kitts and Nevis by a Local. Discover St. Kitts Nevis Beaches. Official WebSite of Annual Music Festival. St. Kitts Music Festival. Currency of St. Kitts. St. Kitts Paper Money. Map of St. Kitts. Caribbean-On-Line. History of "Saint Kitts and Nevis"
This page was last modified on 20 October 2016, at 16:45.